WITH Ustad Vilayat Khan’s death, Punjab, especially Jalandhar, has lost a celebrated guest, a star performer at its annual Harballabh Sangeet Sammelan. Despite his many engagements all over the world, the maestro never forgot Jalandhar and cherished the love of its people. He made it a point to participate in the Harballabh Sangeet Sammelan every year, almost without a break for about 50 years. He had, however, stopped coming to Jalandhar for the past about 10 years due to ill-health. `A0"His death has come as a great loss to Indian music," Shujaat Ali Khan, a fourth generation sitarist and son of Ustad Vilayat Khan, told The Tribune in a telephonic talk from Mumbai. "I don’t remember even a single important stage in any part of the world where he had not performed." 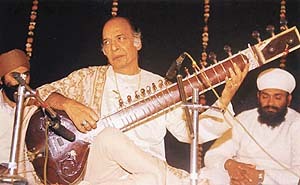 He was`A0known for having introduced the much-appreciated gayaki ang in sitar playing. Having given countless performances in India and abroad, Khan was revered as an accomplished teacher and was an institution in himself. He had refused several top awards, including the Padma Shri, Padma Vibushan and Padma Bhushan, as he was of the view that there was no fixed criteria for conferring these awards and they were usually the outcome of lobbying. Says Shujaat Khan: "He refused awards owing to lack of any standard selection criterion and because he felt he was not treated fairly by the government. He never thought of anything except Indian classical music." He had also given music to several films, including the Kamasutra and Jalsagar, a Bengali venture by Satyajit Ray. Son of Ustaad Inayat Khan, himself the royal musician of the Gauripur state in West Bengal, Vilayat Khan was born at Gauripur in 1928. Since music was in his blood, as even his grandfather Imzaad Khan was an acclaimed musician of his times and player of the sur bahar (big sitar) player, Vilayat Khan was initiated into the world of music when he was just about six years’ old. He learnt the basics of music from his father, who unfortunately died when Vilayat Ali was just 15. His mother, instead of losing heart after the death of her husband, resolved to make her son a renowned musician at any cost. She, made him undergo rigorous riaz everyday. "Ustad Vilayat Ali used to tell us how he was made to do riaz all through the night by his mother," S.L. Mishra, a Jalandhar-based sitarist, remembers. THIS is the finale, Luciano Pavarotti said at the recent performance of Tosca, his last opera after more than four decades of a career that transformed him from an insurance salesman to perhaps the most beloved classical singer ever. he took his final bow at the Metropolitan Opera House, the stage that made Pavarotti famous as the singer with the big belly and super-sized smile.